As is evidently clear, dietary habits and lifestyle patterns are associated with the prevalence of risk factors for chronic disease (Manios et al. 2010); as nutrients are consumed in combination it is the synergy of nutrients within the context of a healthy dietary pattern that is frequently associated with a reduced risk of disease (Schwingshackl & Hoffmann 2014). Relating to this observation, pattern analysis has emerged as an increasingly common approach for studying the potential impact of diet-lifestyle as a whole in relation to disease prevention. To perform pattern analysis specific to diet multiple composite indices have been developed (e.g. the Healthy Eating Index (HEI), Healthy Beverage Index (HBI), Alternative Eating Index (AHEI) and the Dietary Approaches to Stop Hypertension (DASH) score), each of which evaluates the degree of adherence to dietary-lifestyle guidelines, providing an aggregate score based on multiple components, resulting in a single “snapshot” summary of diet-lifestyle quality. Previously mentioned in some of my earlier posts, children’s dietary behaviours often pass on into adolescence and adulthood. Such continuation of behaviour exploits a potential opportunity for manipulation – thus, how might the utilisation of a dietary scoring system, possibly as a medium for competition, affect children’s adherence to dietary guidelines and ultimate diet-lifestyle quality? The capability to devise a composite index for children (and likely applicable for adults too), that isn’t overly complex and/or labour-intensive, has been proven possible in a study conducted by Manios et al. In their study, Manios et al. 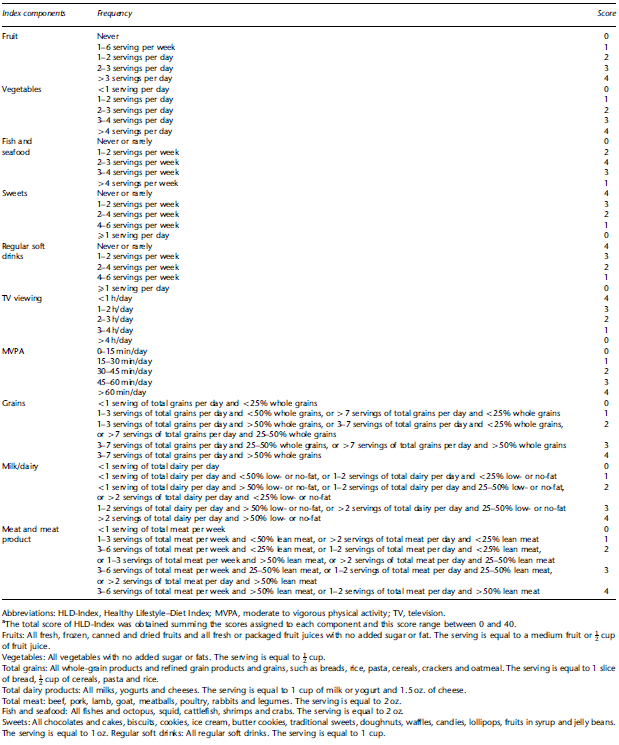 developed a Healthy Lifestyle-Diet (HLD) Index based on the frequency of consumption of specified components (See here). According to their results, regardless of removing the estimation of selected nutrient intakes, it was found that higher values in accordance with the HLD-Index were strongly associated with higher intakes of selected nutrients and lower percentages of children with intakes below the Estimated Average Requirement (EAR) for nutrients that are necessary to support normal growth and optimum health of children (Manios et al. 2010). Conclusively, indicating an effective instrument for the assessment of diet-lifestyle quality of primary schoolchildren. Hypothetically, utilising such an instrument as a sort of weekly or monthly ‘assignment’ where students input their 24-hour intake, creating a scored assessment in relation to the index’s components, may instill a form of competition where persons presumably aim to achieve the highest scoring diet – highest score among friends and peers must be impressive, right? Friends, advertising, and promotion of commercial products have all shown to affect negatively the eating habits of adolescents (Acar Tek et al. 2011), therefore maybe friendly competition and enhanced promotion of dietary guidelines will prove to act positively. Limitations likely exist in the execution of implementing a simplified form of pattern analysis: referring to the instrument as an assignment would likely dissuade individuals from participation and focusing on frequency of consumption may incur issues of poor estimation and, as with many dietary assessment strategies, recording bias. However, overcoming some of these limitations may be achieved by providing the instrument in an easily understandable and accessible format. One such format may be that of an app, whereby persons can input their dietary intake via a mobile device – exploiting societies dependency on technology. Using the HLD-Index as an example, this app would enable measurements of consumption frequency for fruits, vegetables, grains, dairy products, meat, fish/seafood, soft drinks and sweets, possibly providing images to assist with portion estimates, the ability to input real-time updates, and ultimately provide an instant score of how well the person’s diet conforms to dietary guidelines. Potentially, this idea could be initially used for both educational purposes and the promotion of alteration in diet-lifestyle behaviours; however, in accordance with how current research indicates that a high-quality diet, as assessed by composite indices, is associated with a reduced risk of all-cause mortality (Schwingshackl & Hoffmann 2014), could such a strategy also be manipulated to mitigate climate change? “Dietary recommendations for health are based mainly on nutrient requirements (which can be achieved through many combinations of foods), whereas the environmental impact is associated with the reduction of intakes of specific foods (e.g., meat and dairy). There are synergies here; e.g., a reduction in intakes of meat and dairy products could benefit health because, together, these products contribute >50% of the total intake of saturated fatty acids in the UK diet, and a high consumption of red and processed meat has been linked to cancer” (Macdiarmid et al. 2012). In 2010, the Food and Agriculture Organisations (FAO) defined sustainable diets as “those diets with low environmental impacts which contribute to food and nutrition security and to healthy life for present and future generations. Sustainable diets are protective and respectful of biodiversity and ecosystems, culturally acceptable, accessible, economically fair and affordable; nutritionally adequate, safe and healthy; while optimising natural and human resources” (MacdiarmidÂ et al. 2012, Friel et al. 2013, RuiniÂ et al. 2015) – rather a broad definition, no? In the United Kingdom, as in many other countries, the diet of the population fails to meet dietary recommendations by exceeding the maximum recommendations for saturated fatty acids, added sugars, and sodium and failing to achieve minimum recommendations for fibre. These consumption patterns not only fuel a heightened prevalence of disease but also contribute significantly to climate change through greenhouse gas emissions (GHGE) (Macdiarmid et al. 2012). Consequently, to abide such an all-inclusive definition, changes are necessary to existing food-based dietary guidelines to reflect alterations within certain food groups. Well, the solution may not be that simple. Yes, animal-based products are generally associated with relatively large GHGE on a per kg basis. However, studies concerning the best approach to decrease diet-related GHGE have shown that where substituting a product in an isocaloric approach, the resulting variations in diet-related GHGE depend both on the GHGE per kg of the substituted product and also its energy density. If a product is replaced by food with lower energy density, the quantity needed to compensate for the caloric loss is greater than the quantity removed. This may result in a higher diet-related GHGE despite the lower GHGE per kg of the substituted product (Werner et al. 2014). Consequently, reductions in diet-related GHGE may best be achieved without necessarily eliminating meat or dairy products. Possibly most representative in relation to the potential use of composite indices, it was shown that accordance with the DASH dietary pattern – rich in plant foods and low-fat dairy products and relatively low in fats and sugars – exhibited a “negative, monotonic association” with GHG impact; comparison of highest vs. lowest rate of adherence showed an average reduction of 16% in GHG impact (Monsivais et al. 2015). In a study modeled on the UK dietary requirements of an adult woman it was found that a 40% reduction in total meat consumption (equating to 372 g meat/wk: approximately adequate for 4 main meals if used in quantities that match typical meals in the UK today) with a concomitant increase in fruit, vegetables and cereals helped toward mitigating climate change; GHGE of the final diet estimated a 36% reduction from the 1990 baseline (Macdiarmid et al. 2012). According to another modeled simulation, relatively minor differences in the substitution of meat by plant foods translate into significant reductions in GHGEs; Moving from non-vegetarian to semi-vegetarian consumption of meat (Δ of 25 g of ground beef) and from non-vegetarian to vegetarian consumption of meat (Δ of 39 g of ground beef) resulted in approximately one-fifth and one-third fewer GHGEs, respectively (Soret et al. 2014). Ultimately, there is no single sustainable diet. However, the general consensus is that future guidelines illustrate the need to shift away from meat and high fat and/or sweet foods and toward fruit and vegetables and starchy foods (e.g., breast, pasta, rice, and potatoes) to meet both dietary recommendations and reductions in GHG emissions. One proposition to reflect differences in GHGEs would be to subdivide pictorial dietary guides, such as MyPlate or Eatwell. For example, the non-dairy protein section currently includes meat, fish, eggs, beans, and nuts, but in terms of sustainability (or specifically GHGEs), it may be helpful for consumers to know what proportion should be meat (Macdiarmid et al. 2012). However, should a set of definitive food-based dietary guidelines be strategised, the potential for a composite index would drastically increase, providing an opportunity to utilise the aforementioned manipulation of a dietary scoring instrument as a medium for behaviour alteration.